When Papa arrives home, I would then be so excited to open up his luggages for pasalubongs. While everyone is busy with their balikbayan loots, I am also occupied with tinkering the numbers of Papa’s suitcase because in there, I would find his Sony Walkman. However simple as it may seem, I am happy that I can bring the Sony Walkman to school so that by lunch time, I can listen to the countdown from LS FM (97.1). Around 2 or 3 o’clock in the afternoon, I would then listen to some love songs together with my classmates. When I was in 2nd year high school when alternative bands are all the rage, if my walkman could scream at me to stop using it just for one day, it will. Oh by the way, when Papa left again for another contract, he left the Sony Walkman with me!!! From then on, it became my constant companion throughout my remaining high school days and went on till my college days. My Sony Walkman even witnessed my transformation for the music I’ve listened to. From metal, rock, alternative music for perk-me-up days, to classical music when I’m reviewing, to new wave music for feel-good days and to love songs for in-love moments, the Sony Walkman has heard a lot. It was updated with the popular bands and the popular music genre back then. 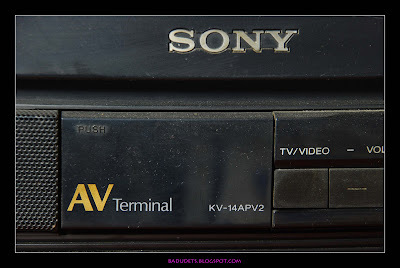 And if the Sony Walkman has a built-in memory in it, it would have saved in its memory all the Eraserheads songs back then, yup, a die-hard Eraserheads fan here, and so is my Sony Walkman. 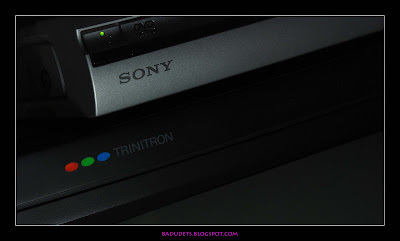 I never had a Sony Playstation. The last game console I had was a Game Boy where I played Super Mario. 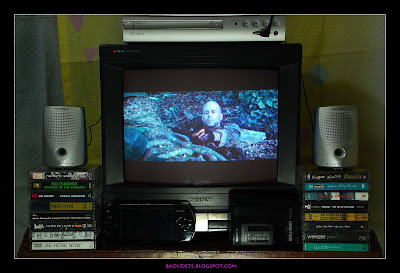 My husband, Jeff, knew that I’m fond of playing games in the computer especially The Sims that’s why he suggested to buy a Sony PSP as our first gadget as a married couple. So technically and legally, it was our first conjugal gadget, if there’s such a thing! Both game addicts, we even set our weekly schedules on who will play on that day and how long is the playing time. A year later, the Sony PSP is still our companion when boredom strikes. During the lull hours in the office, my officemates and I will play Bomberman, or when Wi-Fi is available, I sometimes use it to check on my emails and online shop. Jeff also uses this for storing his music and photos. Sony has the right products for the young and old alike. My Sony gadgets definitely gave significance in my life just like the Sony’s World’s First Slimmest Camera with Optical Image Stabilizer, the Cyber-Shot T77, which became a girl’s bestfriend because it can be brought anywhere without making a girl’s bag too heavy and bulky. Unlike the first blogs that I started, I wanted to keep this blog for good. I want to inform and share to everyone a little something from my daily experiences. The Internet is teeming with information and also teeming with readers eager to read just about anything, from fashion, food, technology, humor, etc… To be able to have my own nook in this World Wide Web, I’m thinking of having my own domain. But I’m still weighing my options if I will really get serious in blogging. Aside from that, I’m a newbie when it comes to web hosting and where to acquire one. Is there a shop for this? Hahaha, honestly, I’m clueless! I stumbled on Web Hosting Geeks, a site that features reviews on different Web hosting providers. I browsed through their Top 10 Web Hosting, Best Budget Hosting, Best Blog Hosting, etc.. The bottom part of the homepage has some articles about all there is to know about web hosting. Looks like I need to do some reading now. I found out that there are many things to consider in buying a domain. Host reliability, storage, technical support and the PRICE are among other things that need to be considered before selecting a provider. Good thing there’s Web Hosting Geek, I can compare Web hosting providers rate by their best price-value ratio. What better way to start the week with some online “window” shopping, right? 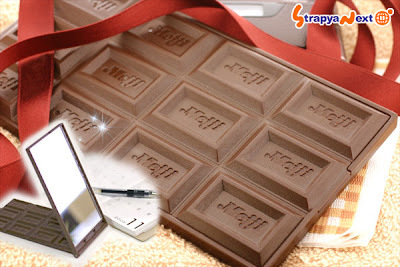 And look, this is one of the cutest thing I’ve found, a Meiji Chocolate Mirror. It looks so good enough to eat, it’s the same size as the real Meiji Chocolate Bar and also comes in the same packaging as the real chocolate. Great gift for chocoholics like me. Retail price is $ 6.78 at Strapya-World.com but it’s currently sold out. And yet another accessory for your camera phones is here, the Kenko Funny Conversion Lens gives your photos a twist. Different effects can be produced such as wide-angle, soft focus, 6-image, and other effects. Just attach these lenses using the adhesive. Strapya-World.com retails these for $ 9.68. Shoppers in the Philippines must be lucky because my friend Jing Samonte of In the Pink is selling these lenses. She calls them Jelly Lens, even celebrity Jolina Magdangal bought her bestseller Jelly Lens. It’s even affordable at Php 500. Visit her site here. Browsing the web and watching movies in our PC has never been this fun. After weeks of hardwork from our full-time day job and a little extra from earning online, Jeff and I decided to pimp our gizmos. We upgraded to a faster PC and faster Internet connection (thanks to PLDT myDSL!) two weeks ago but still used our jurassic CRT monitor then. 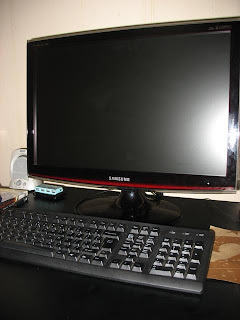 After a while, we decided to switch to LCD because our old monitor is screaming to retire already. What’s great is that SM North Edsa had their 3-day sale, oh how I love payday SALES! 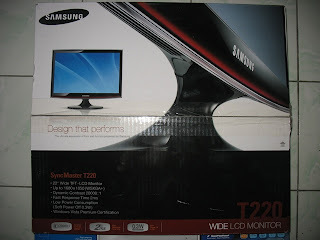 Off we went to Silicon Valley, the particular Samsung LCD model we wanted to buy is unavailable and the only 22″ model available is the new arrival, Samsung SyncMaster T220. How lovely, a blessing in disguise indeed because we thought it wasn’t slated for release yet here in the Philippines. 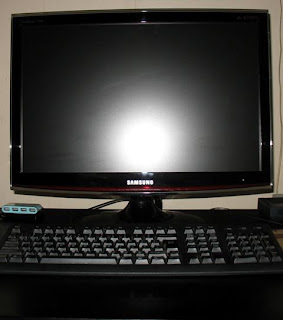 The Samsung T220 is a Php 15,700 beauty that is too beautiful to pass up. Although it’s a little over our budget, we bought it since we saved up for it nonetheless. Appearance-wise, it has a very sleek look, I like the touch-sensitive power button and all the menu adjustment buttons hidden at the right edge. The frame has a hint of red color along the edges which complements the piano-black finish. Contrast ratio is 20,000:1. I don’t have to delve into technicals now, all I wanted to say is I love this LCD!